I’m trying to think of some more reasons why people are like flowers to write in here but actually people aren’t like flowers at all. If flowers were more like people I’d probably water my crocus more often. In the blog section I’ve got an exciting invitation for you. There’s going to be a guest comic / fan-art week and anyone who wants to join in is welcome to. Details here! 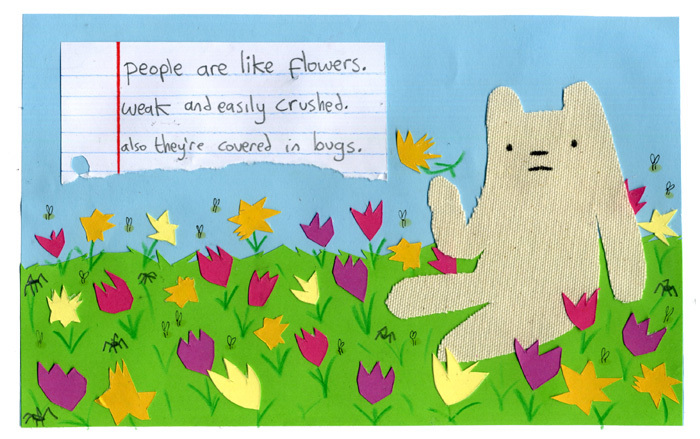 If friends were flowers, I’d rip you from your life structure. Flowers are like friends, in that you can pick them. But flowers are not like friends, in that flowers like it if you cover them in elephant dung. Friends, not so much. people are like flowers, they smell better if they’re alive. People are like flowers, they blossom and then die. some of which are like you and please your ‘tastes’. Man, I was hoping it was in haiku form, but still poetic nonetheless! They’re weak and easily crushed. Lol, the polar bear has some interesting thoughts to share.